Mattresses are generally considered the main living and breeding ground for dust mites since they provide ideal environmental conditions along with a plentiful supply of food. In fact, it’s well-known that dust mites are more common at the top surface of foam and sprung mattresses; however, if food is available and conditions are suitable, dust mites may be present throughout solid foam mattresses as well. Contrary to popular belief, the dust mite concentration in mattresses is not directly related to the age. Differences between mite numbers in mattresses and carpets may be related to their age, but they can also be influenced by a number of other factors such as room temperature, humidity, vacuuming and type of mattress or carpet. Indeed, many environmental factors contribute to the buildup within mattresses, so introducing regular mattress cleaning can reduce these concentration by millions. Dust mites (dermatophagoides farinae) are microscopic creatures that thrive in your home, especially warm and humid areas like your pillows and mattresses. They are tiny, unseen by the naked eye, too small to be crushed by humans, and are equipped with 8 legs and a mouth appendage. Dust mites survive by eating your skin! Every hour, we shed approximately 1,500,000 dead skin flakes. An average night of sleep can yield over 12,000,000 dead skin flakes, and each day, it all ends up IN YOUR MATTRESS! Dust mites eat your dead skin cells (called “dander”), which is why they absolutely thrive in your bed. This is where you consistently spend most of your time in one spot, and the skin cells your body sheds provide a feast for the tiny, irritating critters! Why do dust mites cause allergies? The dust mites themselves are not actually an irritant to humans, it’s their feces that causes Dust Mite Allergies! Each and every dust mite is capable of producing over 20 dung droppings daily. 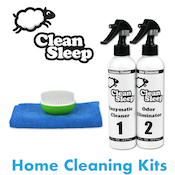 Since people shed an estimated of 1/5 cup of skin a week, just by sleeping in your bed you are providing the perfect ecosystem for dust mites to thrive, and that’s exactly what they do! Symptoms of an allergic reaction to dust mite feces includes sneezing, itching, discomfort, watering eyes, runny nose and even asthma attacks. Consult your family physician if you believe you or someone in your home may be exhibiting symptoms or allergies. Vacuuming and steam cleaning have both been shown to kill and remove dust mites and the allergens they create. Neither step does it alone: it is a combination of vacuuming, heat, and steam with low moisture-content that has shown the most effective. Excessive heat reduces the humidity level and also creates an environment not suitable for their survival. Furthermore, information linking the effect of ultraviolet C on deactivating dust mite eggs adds to the fight against the irritants. Clean Sleep technology was created, based on these facts, to decisively counter these pests. Dust Mites are a real problem! Dust mites range from 200 to 500 microns in size. To give you an idea of how small that is, as many as 100,000 dust mites can live in a single square yard.